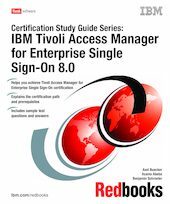 This IBM® Redbooks® publication is a study guide for the "IBM Certified Deployment Professional - IBM Tivoli® Access Manager for Enterprise Single Sign-On V8.0" certification test, test number 000-020, and is meant for those who want to achieve IBM Certifications for this specific product. The IBM Tivoli Access Manager for Enterprise Single Sign-On Certification, offered through the Professional Certification Program from IBM, is designed to validate the skills required of technical professionals who work with the implementation of the IBM Tivoli Access Manager for Enterprise Single Sign-On Version 8.0 product. This publication does not replace practical experience, and it is not designed to be a stand-alone guide for any subject. Instead, it is an effective tool which, when combined with education activities and experience, can be a very useful preparation guide for the exam. The update on 8 January 2010 fixes a mixup of terms on page 12 where the term AccessAdmin had been accidently used instead of AccessAgent.